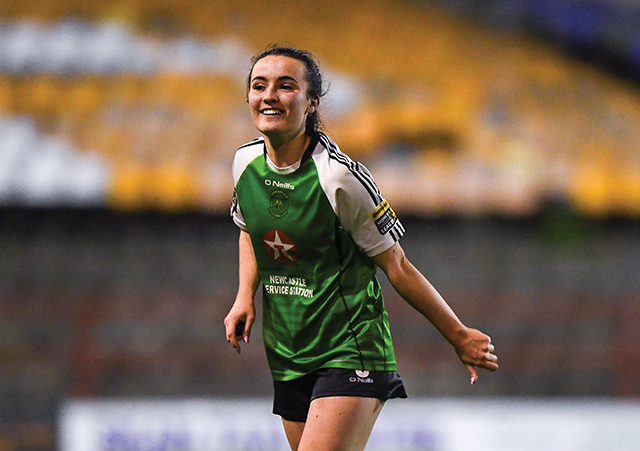 Peamount United and DCU midfielder Niamh Farrelly capped off an impressive season with a nomination for Women’s National League Senior Player of the Season. Farrelly’s Peamount United fell just short in the FAI Women’s Cup Final two weeks ago, losing 1-0 to Wexford Youths, despite dominating large periods of the game. “It was a disappointing result. We played some good football but just didn’t take our chances on the day,” Farrelly told The College View. Peamount finished third in the Women’s National League this season, behind champions Wexford and Shelbourne Ladies. James O’Callaghan’s Peamount did deny Wexford a fourth title this year, as they beat the Ferrycarrig outfit in the League Cup final. Farrelly wants Peamount to look at the positives, including winning the league cup, and to push on further next season. “We have to reflect and work on what let us down this season but also take the positives from the season as a whole. “Winning the league cup will give us confidence to push on next season to hopefully bring more silverware back to the club,” Farrelly said. The 19-year-old’s performances have been recognised this season having been named the Continental Tyres Women’s National League Player of the Month for September. Farrelly was also nominated for Senior Player of the Season alongside Peamount and DCU teammate Amber Barrett, Galway’s Aislinn Meaney and Wexford trio Kylie Murphy, Rianna Jarrett and Lauren Dwyer, with Jarrett claiming the award. However, she stressed that she wouldn’t have gotten any award without her teammates. “Getting the player of the month was brilliant for my confidence and obviously to be nominated for Senior Player of the Year alongside great players like Amber and Rianna is great,” Farrelly said. “But no individual award is close to winning something with your team. “I wouldn’t have gotten any award without my teammates who have pushed me in training week in and week out and have helped me improve throughout the season so I’m thankful for them,” Farrelly continued. Farrelly was the Ireland U19 captain but has made the step up to the senior squad this year. She has, however, been ruled out of the squad for the final training camp of the year, as the Women’s National Team prepare to face Belgium and Wales in the new year. “Unfortunately, I was ruled out with concussion after the clash (with Edel Kennedy in the FAI Cup final). DCU Soccer beat IT Sligo 3-2 in their first league game this season, with a long-range strike from Farrelly, in her only game to date due to Peamount commitments, and a brace from Abbie Molloy, completing the comeback. DCU have fallen to two heavy defeats since but with players like Amber Barrett and Lynn Craven, along with Farrelly, set to come back into the fray, Farrelly believes the squad can do well. “As a squad, we are only really getting to know each other but there’s some very talented players in the group and I know we can do well.